ANTIDOTE FOR TOO MUCH HOLIDAY FOOD? A QUICK, LIGHT SPICY THAI TOFU DISH! NOTE: Instead of the soymilk and coconut flour or creamed coconut, you can use a generous half cup of lite coconut milk. Whisk together the peanut sauce ingredients in a small saucepan and heat gently. In a small bowl, mix 1/2 cup of this sauce with the vegetarian "oyster" sauce, sesame oil and hot sauce. Reserve the rest of the sauce in the pan. Heat the peanut oil in a large nonstick skillet or wok. Add the tofu cubes and quickly brown them. Add the peanut sauce/"oyster" sauce mixture in the small bowl to the tofu. Stir this around until the tofu absorbs most of it. Add the spinach to the tofu and stir over high heat JUST until the spinach wilts. Spoon the mixture immediately over steamed rice and top with the remaining peanut sauce. Nutrition (per serving): 352.4 calories; 62% calories from fat; 24.8g total fat; 0.0mg cholesterol; 582.7mg sodium; 1049.2mg potassium; 15.9g carbohydrates; 5.1g fiber; 7.2g sugar; 10.8g net carbs; 19.7g protein; 8.3 points. Before Christmas arrives, I'd like to share one more recipe from my new book, World Vegan Feast...a beautiful and mouthwatering modern version of a Christmas treat with over two centuries of history behind it. 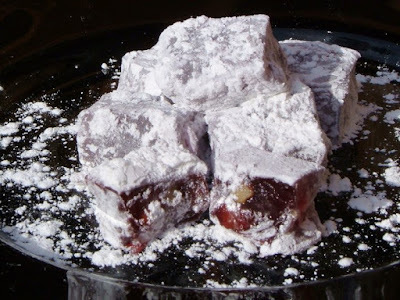 Doing a little research, I discovered that Turkish Delight, traditionally known as Lokum, indeed originated in Turkey, invented in 1777 by famous confectioner named Bekir Effendi (known as Haci Bekir after his hajj pilgrimage). Haci Bekir owned a candy shop in the Bahcekapi district of Istanbul, which is still open today in the exact same location. Haci Bekir’s 5th generation descendants believe the first recipe for Lokum originated from an Anatolian candy traditionally made using honey or grape molasses (pekmez) and flour. Haci Bekir transformed this into Lokum, using the at-that-time-newly-available ingredient, sugar, and cornstarch (called cornflour in the UK and many other regions). Turkish Delight, or Lokum, if you prefer, has a soft, gelatin-like texture, often with chopped nuts inside, and subtle flavoring. It is cut into small cubes and coated in powdered sugar. Lokum became very popular among Turks and Haci Bekir was appointed Chief Confectioner for the Ottoman Court and awarded a medal of honor by the Sultan. This jewel-like treat was soon discovered by an English traveler who called the candy “Turkish Delight” and introduced it to Europe. 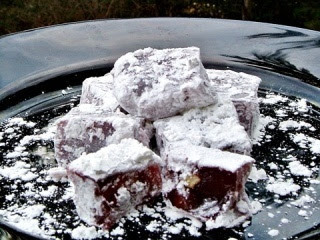 Today, in many countries around the world, Lokum is still known as Turkish Delight. Haci Bekir’s confectionery is the oldest company in Turkey to operate from its original location. It now has representative companies in several countries and , though the original recipe for Lokum has changed very little, the company sells Turkish Delight in 12 flavors, but not pomegranate! I thought that pomegranate juice would be an ideal base for this candy, not only because of its tart/sweet flavor and nutritional qualities, but because if is beautiful color. Walnuts seemed to me to be an ideal addition. This actually turned out to be very simple to make and a very satisfying and eye-appealing Christmas treat. This candy is quite refreshing and very beautiful. 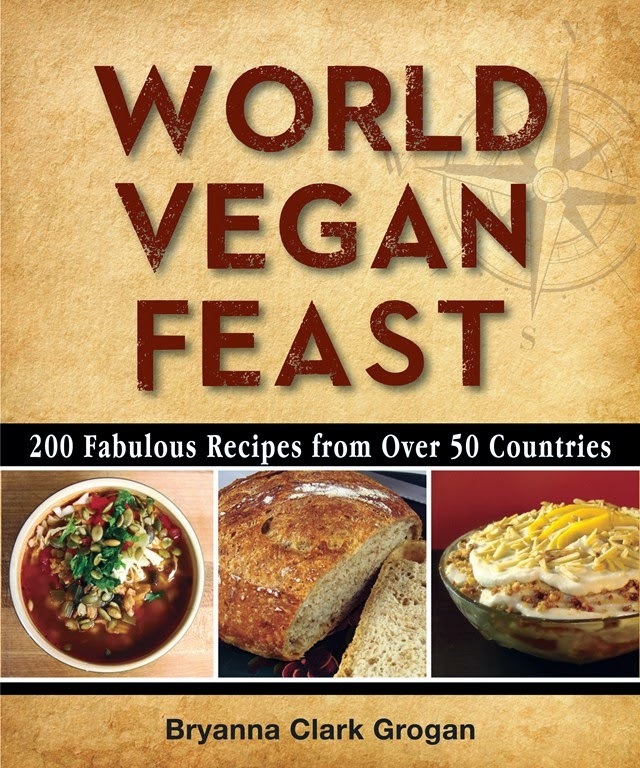 The recipe is from my new book, World Vegan Feast . NOTE: If you follow the links in the ingredient list, you can see that you can make this with organic, fair trade ingredients. Mix 1 cup water with the pomegranate juice and set it aside in a medium saucepan. Combine the sugar and 3/4 cup water in another medium saucepan over medium-high heat and stir until the sugar is dissolved and the liquid starts to bubble. Allow the mixture to boil, without stirring, until it registers 260ºF on a candy thermometer (this takes about 15 minutes). While the sugar mixture is coming to temperature, sift the 1/2 cup cornstarch and cream of tartar together into the water/pomegranate juice mixture. Whisk it until all of the lumps are dissolved. Cook it over medium heat, whisking constantly, until it becomes very thick and clear looking. Reduce the heat to low and continue stirring with a wooden spoon. As soon at the candy thermometer in the sugar/water mixture registers 260ºF, remove the mixture from the stove. Pour the hot mixture slowly into the cornstarch mixture, whisking vigorously. When it is thoroughly combined and formed into a thick sticky paste, add the walnuts and continue cooking, stirring all the while with a wooden spoon, over low heat for 45 minutes longer. The paste will continue to thicken during this time and should be very thick. Microwave Option: I get impatient with making candy, which is one reason why I seldom make it, so. You can microwave it from the time you add the walnuts for approximately 20 minutes at 50% power. Whichever way you cook it, when the paste is very thick, remove it from the heat and use a spatula to transfer the paste into a well-oiled 8-inch square baking pan. Press the mixture evenly into the pan. Place the pan in the refrigerator to cool for at least 2 hours. The finished product should be quite firm when cool. Remove the pan from the refrigerator. The bottom of the pan should be cold. If it is still warm, chill longer. Mix the remaining cornstarch with the powdered sugar. Spread 1/4 cup of this mixture over a sheet of baking parchment on your work surface. You should be able to lift the Turkish Delight out of the pan with your hands. Place the square of Turkish Delight on top of the powdered sugar/cornstarch mixture and spread more of it over the top of the square with your fingers. Once the square is covered on all sides with a layer of powdered sugar/cornstarch mix, use a sharp knife to cut it into 36 squares. Toss the small squares with more powdered sugar/cornstarch mixture to coat them on all sides. Store the candy in an airtight container. Just cut it in half horizontally and juice it on a orange juicer-- I use a manual one. You get lots of juice out of one large pomegranate! I almost forgot to announce this! Go to this link for the recipe(s) , which I developed a few weeks ago for the So Delicious Dairy Free blog, using their Coconut Milk Beverage (Original) in all three (dairy-free, soy-free, and gluten-free) components of the recipe.These recipes might seem complex at first, but as you'll see, with all three components, you'll be creating a stupendously delicious dairy-free (and gluten-free!) 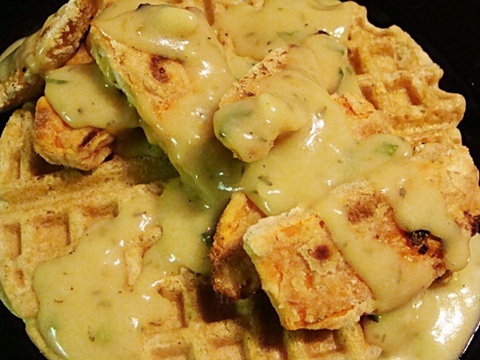 meal— crunchy waffles, crispy sweet potatoes, and the *exceptionally silky* chik'n gravy. (And all can be enjoyed in their own right with the appropriate accompaniment.) And, since most of the recipes can be made well ahead of time, this hearty meal will be a snap to put together when it's time to serve. This blog post is going to be truly short and sweet, as I am recuperating from my first cold in 2 years and trying to summon up enough energy to organize and clean my house, and plan menus and make-aheads for my holiday guests. I want to share a brunch recipe from my new book, The World Vegan Feast. (Actually, you can serve it any time of the day, and it's often served as a bar snack in Spain.) 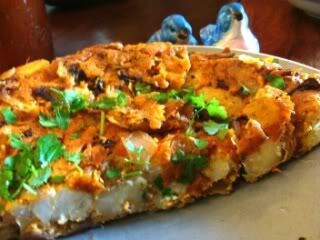 It's a Spanish omelet that is similar to an Italian fritatta, but it always contains potato. 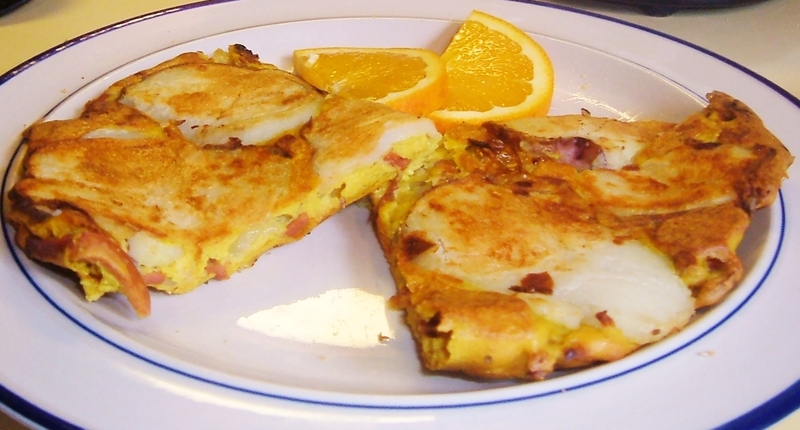 In Spain this omelet is called a tortilla de patatas or tortilla española. I had developed a tortilla española recipe earlier on, but I'm always trying to improve on recipes. I was in the mood for a hearty Spanish potato omelet one day when we were taking lunch over to our friends Jane and Matsuki's house. I chose to make this dish because it’s a perfect choice for toting to potluck meals and picnics, given that it can be eaten hot or at room temperature. It's also open to many variations-- for instance, you might want to add sliced roasted red bell peppers or cooked artichoke hearts. But I thought that my recipe lacked something, so I changed my formula to add some chickpea flour-- bingo! Firmer texture and more eggy flavor-- just what I was after. Just a little aside about spelling: "Omelet" or "Omelette"? This omelet was made a bit thicker than the one pictured above-- those are my friend Jane's cute little bluebird salt and pepper shakers peeking from behind. This recipe may become a staple in your house, as it is in ours. The Romesco Sauce (a vegan version of a classic Spanish sauce), though not traditionally served with this, is a tangy, nutty, tomato-ey surprise! (NOTE: This is not Spanish, but another excellent condiment to serve with the tortilla, is Ajvar, a Balkan eggplant and pepper sauce [my recipe is posted here], widely available, in mild or hot versions, in ethnic grocery stores and gourmet stores, and online). Preheat the oven to 450°F. Add the olive oil to a 10-inch cast iron skillet or pie pan and place the pan in the oven while the oven heats up. Blend all of the Batter ingredients in a food processor until very smooth. Scoop the Batter into a medium bowl and stir in the sliced "ham" or "bacon". Add the sliced onion to the hot oil in the pan in the oven, salt lightly and toss it to coat with the oil, spreading it out evenly. Bake the onions for about 5 minutes. Transfer the onions to the Batter and fold in. Lower the oven temperature to 350°F. Distribute the sliced cooked potatoes evenly in the same hot cast iron skillet or pie pan, brushed with a little more olive oil and spread the batter evenly over the potatoes and out to the edges of the pan. Grind black pepper over the top. Bake the tortilla for 20 to 30 minutes or until the batter is set. Cool the pan on a rack for 10 minutes, then loosen the bottom of the omelet carefully with a thin spatula-turner and cut it into 6 wedges. Eat warm with the Romesco Sauce served on the side. The leftovers are good cold and can be made into a delicious sandwich on crusty bread. Nutrition FactsNutrition (per serving): 234.4 calories; 15% calories from fat; 4.2g total fat; 0.0mg cholesterol; 707.5mg sodium; 829.8mg potassium; 25.9g carbohydrates; 2.7g fiber; 2.1g sugar; 23.2g net carbs; 23.5g protein; 4.5 points. There are many versions of this classic Spanish sauce of Catalonian origin, which is usually served with seafood, but we used my personal version the Spanish Potato Omelet, to our delight. Heat the oil in a small skillet and add the onion and garlic. Sauté over medium heat until the onion is wilted. Transfer the onions to a food processor along with the remaining ingredients. Process the mixture until smooth. Taste for salt. Serve at room temperature. Nutrition (per 1/8th recipe): 70.6 calories; 68% calories from fat; 5.7g total fat; 0.0mg cholesterol; 77.0mg sodium; 95.5mg potassium; 3.4g carbohydrates; 0.8g fiber; 0.8g sugar; 2.6g net carbs; 1.4g protein; 1.7 points. This was definitely Brownie Day for me! I posted three past brownie recipes from this blog on Facebook today (Peanut Butter Swirl Brownies, Chai-Almond Brownies with Double Ginger Gelato, and my Almost No-Fat Brownies), and a new post here on this blog with a recipe for S'more Brownies that I had previously developed for my now-defunct newsletter. But I just had to make some, even though DH and I are on Weight Watchers again. So, I decided to test out an idea I'd been thinking about for quite a while. If it turned out, we'd taste-test a couple each and freeze the rest for our company who will be here over the holidays. Those of you who read my blog may have read the entry about the black beans and brownie mix recipe that I tried from the Internet. I followed the directions and used canned black beans and their juice. The texture wasn't bad, but it tasted so "bean-y". But not "nice bean- was determined to make my own version, though, because it intrigued me to use black beans as part of the fat and instead of the eggs in a brownie. 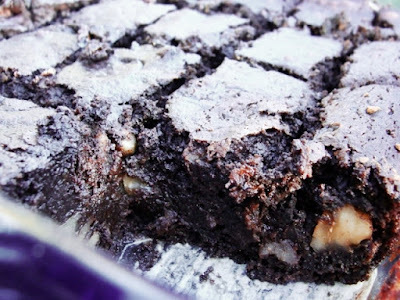 My omni friends had no idea there were beans in these brownies, and gobbled them up! But they were quite rich for my style of cooking and I wanted to test out a fat-free version of the black bean brownies as well as for the okara brownie variation that I had also developed from that recipe. You will notice that there is only 1/2 cup flour to 1 1/4 cups cocoa powder-- this is one reason that the brownies are so chocolate-y despite containing no solid chocolate. Also, you will notice that I bake the brownies at a low temperature (300°F) for fairly long time compared to other brownie recipes. This ensures the proper fudgy-ness without what I consider that distasteful raw texture and taste. I'm going to use this version from now on-- who needs the fat? A bonus-- I have goodies for my company in the freezer! Preheat the oven to 300°F. (Yes, trust me-- only 300°F! See note about this in text above.) Spray a 9-inch square pan with oil from a punp sprayer and line the bottom with baking parchment cut to fit, with the parchment going up 2 opposing sides to the rim of the pan. This allows you to lift the cooled brownie, uncut, out of the pan with no muss or fuss, if you wish. Combine the water and ground flax seeds in a bowl and let them soak while you assemble the other ingredients. Place the soaked mixture into your food processor and process until the mixture is gloppy, somewhat like egg whites. Add the egg replacer and beat until thick and foamy. Combine the Dry Mix ingredients in a medium bowl. Pour in the mixture from the food processor and fold and stir briefly, just to blend. Fold in the nuts, if using. Scrape the batter into the prepared pan and bake for 50 minutes. Check for doneness with a cake tester or toothpick, it may be a but sticky, but you should not see raw batter. My goal was to make a moist, fudgy brownie, but with no “raw batter” texture and mouthfeel. When it's done, remove the pan to a cake rack to cool. IMPORTANT NOTE: Ovens can vary, pans can conduct heat differently, so test at 40 minutes. If you happen to use a smaller pan, say an 8-inch square one, which will make a thicker brownie, you may have to cook for as long as 65 minutes. 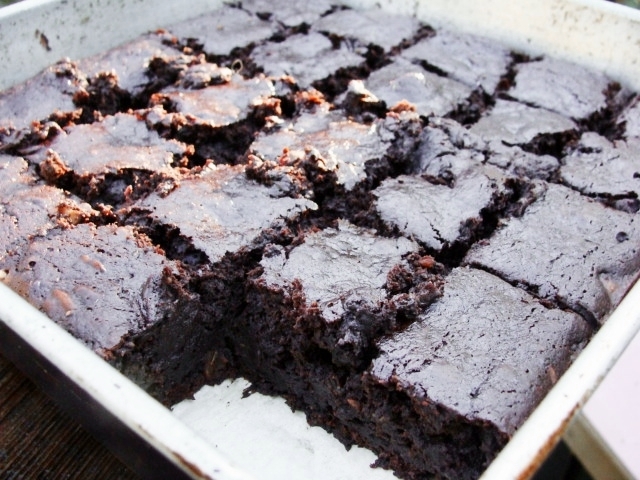 Do not cut until the brownies are cool. You can lift the whole thing out of the pan onto a cutting board, using the parchment liner, if you like, or just cut them in the pan. Use a very sharp knife to cut into 16 squares. Nutrition (per brownie): 206.4 calories; 24% calories from fat; 6.3g total fat; 0.0mg cholesterol; 67.0mg sodium; 268.3mg potassium; 38.3g carbohydrates; 4.6g fiber; 26.1g sugar; 33.7g net carbs; 4.2g protein; 3.9 points. With only 1/2 cup nuts: Nutrition (per brownie): 182.5 calories; 16% calories from fat; 3.9g total fat; 0.0mg cholesterol; 66.9mg sodium; 252.2mg potassium; 37.8g carbohydrates; 4.4g fiber; 26.0g sugar; 33.4g net carbs; 3.6g protein; 3.2 points. With no nuts at all: Nutrition (per brownie): 158.6 calories; 6% calories from fat; 1.6g total fat; 0.0mg cholesterol; 66.8mg sodium; 236.1mg potassium; 37.3g carbohydrates; 4.1g fiber; 25.9g sugar; 33.2g net carbs; 3.1g protein; 2.5 points. 3/4 cup packed, well-squeezed okara (soybean pulp from making soymilk or tofu)-- do NOT use very wet okara, please. Nutrition (per brownie): 196.6 calories; 25% calories from fat; 6.4g total fat; 0.0mg cholesterol; 67.4mg sodium; 242.4mg potassium; 36.5g carbohydrates; 3.7g fiber; 26.1g sugar; 32.8g net carbs; 3.4g protein; 3.7 points. With only 1/2 cup nuts: Nutrition (per brownie): 172.7 calories; 17% calories from fat; 4.0g total fat; 0.0mg cholesterol; 67.4mg sodium; 226.2mg potassium; 36.0g carbohydrates; 3.4g fiber; 26.0g sugar; 32.5g net carbs; 2.9g protein; 3.1 points. With no nuts at all: Nutrition (per brownie): 148.8 calories; 6% calories from fat; 1.6g total fat; 0.0mg cholesterol; 67.3mg sodium; 210.1mg potassium; 35.5g carbohydrates; 3.2g fiber; 25.9g sugar; 32.3g net carbs; 2.3g protein; 2.5 points. 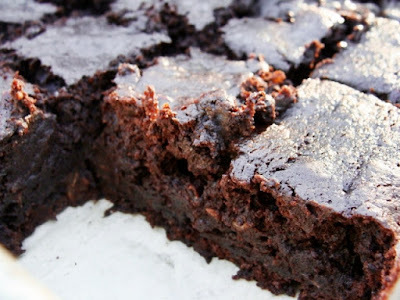 For National Brownie Day, I'm re-posting an updated version of this recipe that I developed for my now defunct Vegan Feast Newsletter several years ago. These are to die for, except you don't have to! Dark vegan brownies, baked on a graham cracker crust, with a luscious vegan marshmallow crème on top-- inspired by the old Girl Scout camp dessert. To make the Graham Cracker Crust: Mix the crust ingredients and press in the bottom of a greased 8-inch square cake pan. Bake for 6-8 minutes, or until lightly browned. Cool on a cake rack. In a small saucepan, melt the vegan butter and 3 T. water gently over medium heat, OR melt it in a medium microwave-proof bowl in the microwave for 1 minute. Stir in the sugar until dissolved, then stir in the cocoa, vanilla and coffee powder. Set aside. IF YOU USE OIL INSTEAD OF VEGAN BUTTER, skip the melting step. Just mix the oil with 3 T. HOT water and stir in the sugar, then the cocoa, etc. (I use a whisk for the cocoa). Place the 1/4 c. water, flaxseeds and egg replacer in a blender. Blend on high for several minutes, until the mixture is "gloppy" like slightly beaten egg whites, with little brown flecks of flax skin throughout. Fold this into the cocoa mixture. In a small bowl, mix together the flour, baking powder, and salt. Add the flour mixture to the cocoa mixture and stir briefly. Spread on the brownie batter top of the baked graham cracker crust. Bake for about 15 minutes. You may have to experiment with timing, according to your oven (try to use an oven thermometer to check the temperature, which can vary even in new ovens), and according to how fudgey you like the brownies. 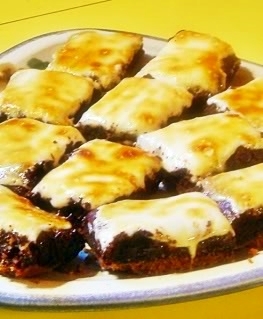 Spread the brownies with the Ricemellow Crème while they're still hot-- and don't be tempted to spread on too much. It's very sweet and gooey and a little goes a long way! Use just enough so that the brownie layer is covered. Place the pan 4 inches under the broiler and WATCHING CAREFULLY, broil until it bubbles up and browns. This takes very little time! Or, use a culinary butane torch. Cool on a rack, then cut into 16 squares. Serve at room temperature. Nutrition (per serving): 154.0 calories; 29% calories from fat; 5.2g total fat; 0.0mg cholesterol; 107.4mg sodium; 130.6mg potassium; 26.8g carbohydrates; 1.7g fiber; 18.8g sugar; 25.1g net carbs; 1.5g protein; 3.2 points. Instead of the Ricemellow Creme, you could place vegan marshmallows ( this brand or this one) on top of the brownies, broil as instructed. NOTE: Sweet & Sara's brand contain palm oil. I made this the other day for my husband's photography students (they were having a little party at the end of the course), and I'd like to share it with you for holiday entertaining. It's adapted from my book, The Fiber for Life Cookbook. This type of vegetarian pâté appeared in mainstream magazines in the early 80's and became deservedly popular party fare. I think it must have originated with this Blue Diamond® Almonds recipe, which is listed on their website as one of their "classic" recipes. 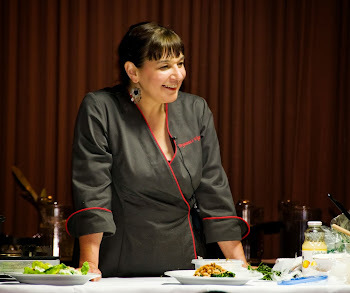 For the book, I modernized (and veganized, and lowered the fat) it by omitting the butter, using fewer almonds and more mushrooms, and using slightly more authoritative seasoning. This time I decided to use smoked-hickory almonds for even more flavor, and it worked beautifully-- it's even more delicious, I think. Process the onion and garlic in a food processor until finely chopped. Add the mushrooms through the top with the motor running, until they are all chopped. Spray a large nonstick, hard-anodized or cast iron skillet with a little oil from a pump sprayer and heat it over medium-high heat. When it's hot, add the chopped vegetables, salt, thyme and pepper, and cook, stirring frequently, until the liquid exudes from the mushrooms, and then has pretty much evaporated again. Remove from heat. While the mushrooms cook, clean and dry the food processor bowl and blade. Place the smoked almonds into the cleaned and dried food processor and process them until they almost become a paste. With the machine turned off, scrape them from the sides toward the inside and then add the cooked mushroom mixture and the wine. Process the mixture until quite smooth, stopping the machine to push the mixture towards the blade if necessary. Nutrition (per 1/4 cup): 158.5 calories; 64% calories from fat; 12.4g total fat; 0.0mg cholesterol; 237.5mg sodium; 369.5mg potassium; 7.7g carbohydrates; 3.6g fiber; 2.6g sugar; 4.2g net carbs; 7.0g protein; 3.5 points. 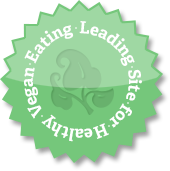 I'm going to be posting more low-fat or fat-free recipes this month (interspersed with holiday recipes) because DH and I are back on our vegan version of the old WW Core Plan (lost 4 lbs. each last week). This morning I had a rare craving for granola, so I dug out my old recipe for almost-no-fat granola made in the microwave and tweaked it for my new, more powerful microwave, and also to what flavors I fancied. A microwave works so well for making small batches of granola without added oil. 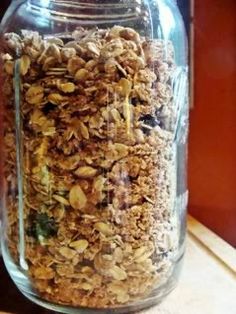 (Many homemade and commercial versions of granola contain over 3 times the fat grams as this recipe.) It takes less than 10 minutes all together, so it's no trouble to make a batch when you run out. (Afraid of microwave ovens?) I also found that this did not make my jaw hurt from chewing so hard, as is the case with some granola cereals I have encountered! But it could be "chunkier", so I have an idea for overcoming that-- I'll keep you posted. 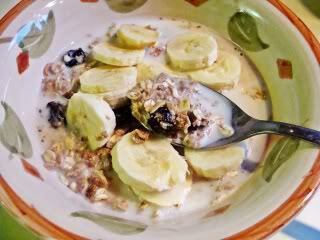 Half a cup of this cereal with half a banana and some soy milk kept me going all morning! Want to know the origins of granola? Here's an interesting history. This recipe is adapted from one in my book "The Fiber for Life Cookbook". NOTE: Without fruit, this makes a good nut substitute for low-fat baking. NOTE: You need a 2.2 cubic ft. capacity microwave for this recipe. Mine is 1200 watts. If yours is weaker, you may have to cook it in 3 minutes increments instead of 2 minute ones. 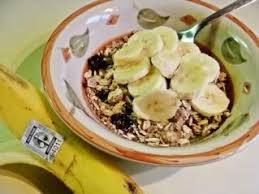 Mix all of the ingredients (except the dried fruit) together thoroughly in a medium bowl. Spread the mixture evenly on baking parchment cut to fit the microwave carousel. Cook on full power for 2 minutes. Stir gently and spread out evenly again. Cook 2 minutes more, stir gently, and push the granola in the center of the carousel out toward the edges, leaving an empty space in the center of the carousel about 3-4 inches across. The reason for doing this is that the center tends to burn towards the end of cooking. 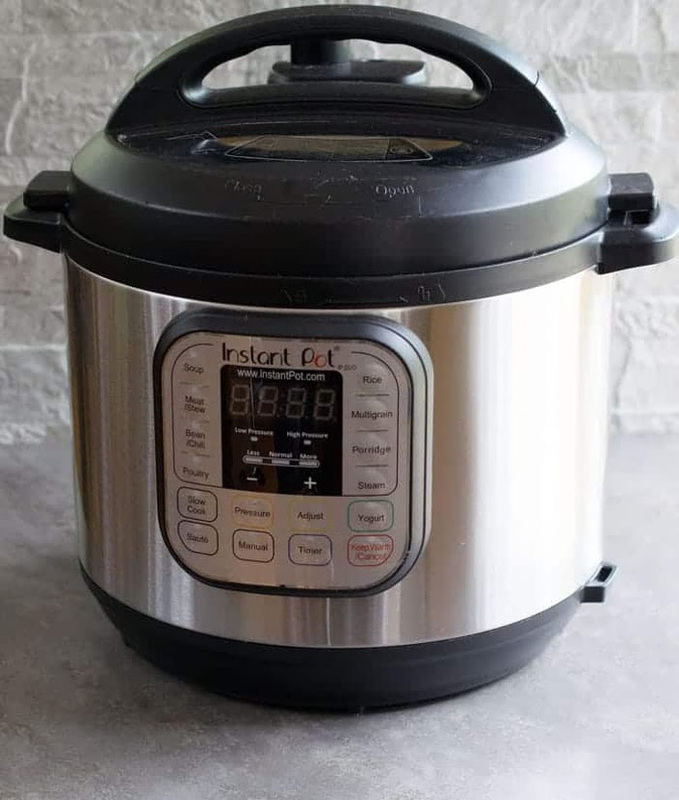 Cook for 2 minutes more. The mixture should be light golden. Dump the granola onto a baking sheet with sides and add the dried fruit. Cool completely, stirring once in a while. Nutrition (per 1/2 cup serving): 220.5 calories; 18% calories from fat; 4.9g total fat; 0.0mg cholesterol; 64.5mg sodium; 213.2mg potassium; 41.7g carbohydrates; 6.3g fiber; 8.6g sugar; 35.5g net carbs; 5.9g protein; 4.0 points.